Question: Looks like I’m done fishing for the year. Any tips on the best way to store my gear? One of the most important things you can do before storing any reel — and especially those that use compressible drag materials like cork — is to back off the drag. Photo by Marshall Cutchin. Rods: Wash them thoroughly with the hose, or even take them into the shower with you. You can use an old toothbrush to lightly scrub the hardware, making sure all the grit is out of the reel-seat threads and anywhere else in the seat. Scrubbing the cork will remove a lot of the nasty color you’ve added over the year.Completely dry the rod, and then put it in its sock and tube. Lay the tubes horizontally, and if you don’t fear mice or other vermin, leave the end caps off the tubes to allow the rods to “breathe” and to ensure heat or moisture doesn’t build up inside somehow. Reels: Wash them thoroughly, taking them apart to ensure you’ve gotten any dirt, salt, or other schmutz taken care of. Use soapy water and a toothbrush. Rinse and then dry thoroughly, making sure you turn the reel parts several times during drying to make sure all the water gets out.Store the reel in its bag, but before you do so, back the drag off completely to take pressure off the drag materials. 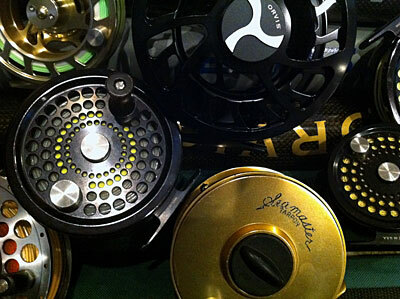 Lines: Take them off the reel, clean with the manufacturer’s recommended solution, and then wipe them clean with a rag. Check for damage to the line and make any necessary repairs. Waders and boots: Air them out completely and make sure they are perfectly dry. Check for leaks and make any repairs. Hang for the winter. Boot-foot waders should be hung upside down by the boots. Flies: Open all your fly boxes and let everything inside dry completely before storage. The important thing, as you’ve probably figured out, is to put everything away DRY.